We carry a wide selection of bingo fingertip slide cards. You can choose from our standard bingo fingertip slide cards, heavyweight bingo finger tip slide cards, quick clear stitched shutter cards, and easy-read fingertip slide cards. Each card is 7-1/2" x 6-5/8"
Jam-proof: windows won't get stuck! Great for bus trips, school events, picnics, and much more! Size is 6-1/2" x 6-3/8"
Custom Bingo Slide Cards (#WG1-C) - WITH YOUR LOGO! We also offer 5 ply Custom Bingo Slide cards with your logo/design on the bottom of each Card. These Custom-Printed Bingo Shutter Cards are made using our Classic Fingertip Jam-Proof Bingo Shutter Cards (please see above). Please visit our Custom Bingo Slide Card Page for more information. SALE – Save 22% to 42%! We carry a wide selection of bingo masterboards. Choose from bingo masterboards for small wooden or plastic balls, bingo masterboards for ping pong balls, fingertip masterboards, and stitched fingertip masterboards. All of our master boards are in stock for immediate shipment. 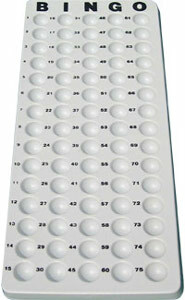 Dozens of bingo products are availabe for immediate shipment. 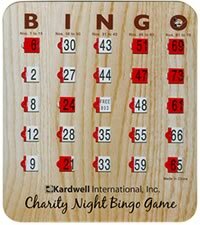 We also carry bingo cages, finger-tip slide cards, bingo balls, glue sticks, bingo masterboards, bingo sets, and many other bingo items. Bingo supplies are available for immediate shipment.